This pin features Chip sitting down with one hand propping him up and the other hand in the air. He is wearing blue sunglasses. This Open Edition pin with spring features Dale balancing on top of Chip's shoulders. Dale moves around on a spring. This pin features Chip behind an orange circle with a 13 in the middle. The word Twenty is above the number thirteen. This pin features Chip in a red square with the number 13. We received this pin as part of our package at Disneyland. Although we booked through Walt Disney Travel, our voucher told us to exchange at the AAA desk inside Disneyland. We received this pin and a AAA lanyard. Pin shows Chip in Rescue Rangers hat sitting in a purple car with black wheels. Cutie (cute character) chipmunk Dale dressed as a sailor, his bow tie is blue and he is holding a grey bucket. This pin features Chip and the '2014' logo. Chip is standing in front of a double-stacked 2014, looking back at it, with Mickey Ears perched on top of the year. Each pin measures approximately: 1 1/2" X 1 1/2". Dale is turned towards the right. Next to him is "2014" written in blue glitter with a small Mickey "ears" hat on top of it. This is the Dale pin from the Limited Release PWP Train Conductor Collection pin series. Dale is dodging a cannon ball going through the bow sail. The card is the Ship's Bow Chair. This listing is for Chip pin ONLY from the Disney Tsum Tsum Pin Collection #108000. This pin features Chip in his simple Tsum Tsum form. His head / face is shown in a cutie / cute style. Below his head is a little glimpse of his cute feet. This listing is for Dale pin ONLY from the Disney Tsum Tsum Pin Collection #108000. This pin features Dale in his simple Tsum Tsum form. His head / face is shown in a cutie / cute style. Below his head is a little glimpse of his cute feet. Chip looks happy on this Open Edition pin. He appears to be dancing with one foot off the ground and his hands in the air. His eyes are looking up. This Open Edition pin features an adorable Chip with an oversized head which is attached with a spring. This pin is part of the Disney Cuties Collection also known as "cute characters." Dale pin from the Happiest Celebration on Earth Deluxe Lanyard Starter Set #37657. Dale (of Chip 'n Dale) jumps for joy, holding both his hands over his head. Size is approximately .75" x 1.0". This listing is for Dale only from the Cute Stylized Characters Mystery Collectible Pin Pack. This 16 pin mystery collection depicts some of our favorite characters in cute cartoon-like stylized form. Each pouch contains 5 randomly selected pins. This listing is for Chip only from the Cute Stylized Characters Mystery Collectible Pin Pack. This 16 pin mystery collection depicts some of our favorite characters in cute cartoon-like stylized form. Each pouch contains 5 randomly selected pins. Chip is firing a cannon ball from the stern of the ship at Dale. This appears to be 2 pins with our favorite chipmunks with nuts, of course. Chip is holding out one to Dale, who already has one in his grasp. Dale also has one in the shell. So who is playing the shell game here as there should be 4 nuts? This listing is for the Dale pin ONLY from the 2014 MNSSHP Mystery Collection (#107380). Dale Tsum Tsum from the Tsum Tsum Christmas Mystery Collection. He is wearing a red Santa hat. This pin is from the Digital Disney Mystery Collection and it features Chip in an old 8-bit video game design. This listing is for the Dale pin from the limited release Popcorns Vinylmation mystery collection (#94994). This limited release mystery collection features Dale in various artistic styles. Behind Dale is a yellow colored background. Pins in this mystery collection: #94995-95004, 95941, and 95942. Note: This pin collection will be shared between Disneyland® Resort and Walt Disney World® Resort. Chip limited release pin for the Grand Opening of the Shanghai Disneyland Resort. Pin features Chip wearing his traditional Chinese hat and coat (in purple) on an orange glitter Mickey head icon. To his right is a yellow silhouette of Shanghai's Enchanted Storybook Castle. Across the middle of the pin are the words: Grand Opening (the O has Mickey ears) in yellow. At the bottom of the pin are the words: Shanghai Disney Resort with Chinese below them, all in white. Dale limited release pin for the Grand Opening of the Shanghai Disneyland Resort. Pin features Dale wearing his traditional Chinese hat and coat (in blue) on a green glitter filled Mickey head icon. To his left is a yellow silhouette of Shanghai's Enchanted Storybook Castle. Across the middle of the pin are the words: Grand Opening (the O has Mickey ears) in yellow. At the bottom of the pin are the words: Shanghai Disney Resort with Chinese below them, all in white. Disney Streets/Disney Parks - Street Signs Mystery Box - Chip Rd. 113668 Disney Streets/Disney Parks - Street Signs Mystery Box - Chip Rd. This Disney pin features the face of Dale in a folded paper design. It is from the Origami Mystery Disney pin collection. Dale is a brown chipmunk with a red nose and two white teeth. This limited edition pin collection features the Disney characters at the Disneyland® Attractions. This pin features Chip 'n Dale in front of Chip 'n Dale Tree-house Attraction in Toontown. Chip is at the top of the treehouse finding acorns. Dale is at the bottom leaning against the sign. Dale is featured as a pin-on-pin element. Part of set # 100288. Chip and Dale have stopped by the Hollywood Studios & are in front of the hat icon. They are both looking up, which is understandable given their small size and the size of everything around them. There is a stylized D on a crest to Chip's right hand side. his pin features Dale from the waist up inside a silver frame that is round at the top and square at the bottom. He is wearing a black Mickey ears hat with "D23" embroidered on it. In his right hand, he is holding a red pennant on a black pole above his head outside the frame. On the flag in silver numbers it has "2011" and a star on it. His left arm with open hand is stretched out slightly behind him to the edge of the frame. Dale is in full color in front of a light blue background. On the frame below his waist in black it has "D23" and below that in black letters it says "The Official Disney Fan Club." This limited edition pin is part of the WDW Mickey's Very Merry Christmas Party (MVMCP) pin series featuring our favorite Disney characters setting up for the holiday season! This two pin set features a stylized Chip and Dale and their respective ornament. The chipmunks are dressed as Christmas elves, with green pointed hats with a white pompom. The two are hanging on to a red and white striped candy cane while Dale holds a blue and red wrapped present. The second pin in the set is a red and pink ornament with a gold topper; the central band features several gold glitter filled peanut shapes. On the center of the ornament is the text "2017 Mickey's Very Merry Christmas Party" screenprinted in red. The pins come on a special backer card which resembles several wrapped gift boxes. Dive into the fun with Chip and Dale as they celebrate Disney's Coronado Springs Resort 10th Anniversary in this Limited Edition pin. Artwork for this pin was created by Disney Design Group Artist Tyler Dumas. The two chipmunks are swimming underwater and are blue! 2015 EPCOT International Food & Wine Festival 20th Anniversary Pin Set. Chip & Dale only. Chip'n Dale are running through Belgium with a Belgium Waffle topped with syrup and whipped cream on a plate. There are mountains and trees in the background. Disneyland 2011 Hidden Mickey Lanyard Series - Tee Shirt collection pin features Chip and Dale on a brown shirt. A silver Hidden Mickey icon is located on the sleeve on the left. This pin is part of the 2011 Disneyland Resort Hidden Mickey Series. In this retro inspired pin-of-the month collection highlights the Disney Characters in front of a Mickey Mouse globe icon. This icon was originally found within the "d" of the original logo for the Walt Disney World® Resort. This limited edition pin has Dale in front of a blue Mickey Mouse globe icon. This is pin 9 of 12.
art of a series of back to school pins featuring characters with books and backpacks. This pin shows Chip with a backpack that is a hinged feature that opens and closes to reveal a picture of Dale. Chip leans against a stack of books - "Back To School" is written across their spines. 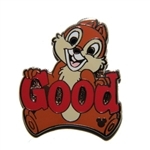 This two pin set shows the famous chipmunk duo, Chip with his chocolate brown nose and Dale with his red one. Both of them have a cutie, anime look to them. Chip & Dale are playing in a pile of Fall leaves in this pin. Chip is the dark Brown with the white strip running down his back with a black stripe in the middle of that. His belly and face are a lighter tone tan. Dale is a lighter brown with the two tone tan color on his face and belly. Both are having fun in the pile of leaves that have a dark brown, gold, red/yellowish tone to them. Both Chip and Dale have their arms locked like they could be dancing in the leaves. This pin is a limited release from Acme/Hot Art Happy & Carefree Series: Full Fun is an official Disney licensed pin made by Acme Archives. It is approximately 1.84"x 2.25" pin and is gold plated. Enjoy the high quality that Acme Archives Shanghai is known for in this limited release Disney pin. This Acme Archive pin will be made for the Pinopolis Pin Game. Each pin will have a random game value etched on the back. This is the sixth pin in the Pin of the Month series and is a hinged, pin on pin design which features the Disney Donut Shop of Chip and Dale. When opened, you can see the storefront which looks like a donut shop with trays of donuts, cookies, eclairs and cupcakes in a display case. On the counter is a computer and what might be a window or mirror. The top of the Donut shop has an alternating awning in two shades of brown, with Disney Donut Shop spelled out in red above it. The hinged door are two frosted cookies with ears like Chip and Dale. The back of the pin has a single pin post with two small nubs and the standard Mickey waffle pattern. It has the Disney Pin Trading logo box, Limited Edition 3000 box, ©Disney made in China box below the post and the FAC box is on the left side. Available at both WDW and DLR. his is part of a series of pins featuring Disney characters performing various acts on stage. Chip and Dale are performing William Tell, with Chip shooting the arrows and Dale has an apple on his head with an arrow though it. Chip and Dale are a pin on pin element. The back has one post and the Disney Soda Fountain ice cream cone pattern. This is a Spotlight Pin, featuring Chip and Dale sitting in front of a bag of peanuts. The Bag is purple striped with a banner of red which says "Chip and Dale Snack Company". The overflowing peanuts are made from PVC. The reverse of the pin has the standard Disney Icon , states" Limited Edition of 1000" and " Spotlight Pin 1 of 5 "